Tying 3D art to community creators is a smart idea. 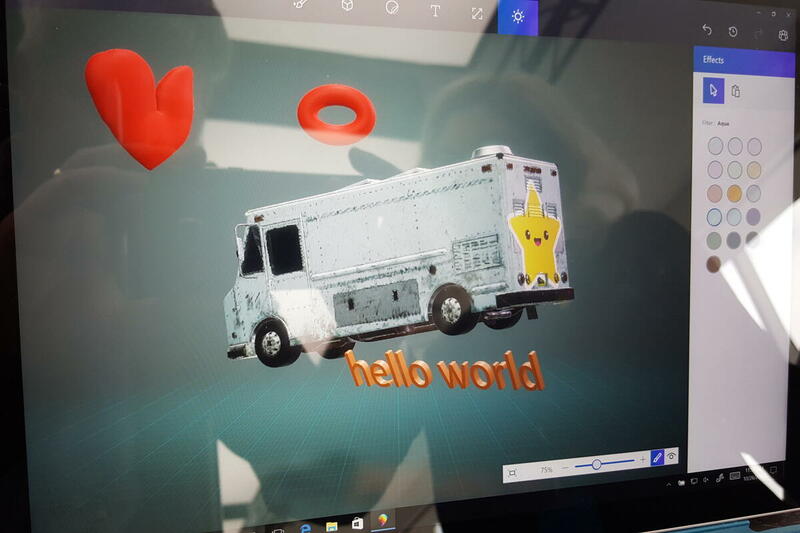 Floating somewhere on the Internet is a PCWorld burrito truck, thanks to the power of Microsoft’s Paint 3D Preview. One version even has wings. Virtually everyone who’s used Windows is familiar with Paint, the default drawing program that’s shipped with generations of Windows. 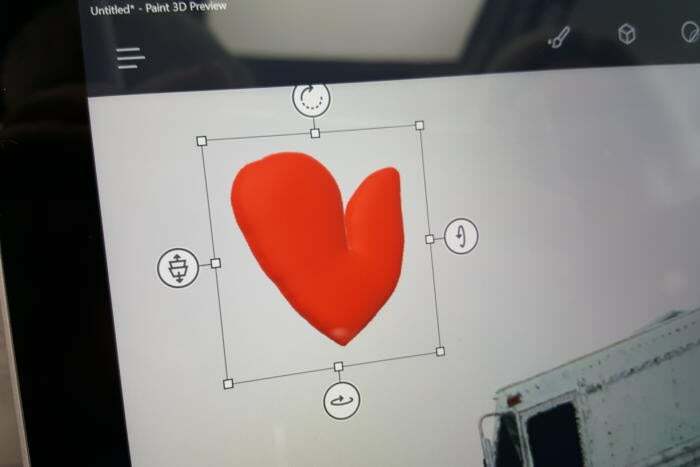 Microsoft needed a bridge between Paint and a new generation of users that Microsoft wants to get hooked on HoloLens and 3D printing, so it created the 3D Builder app in Windows 10. 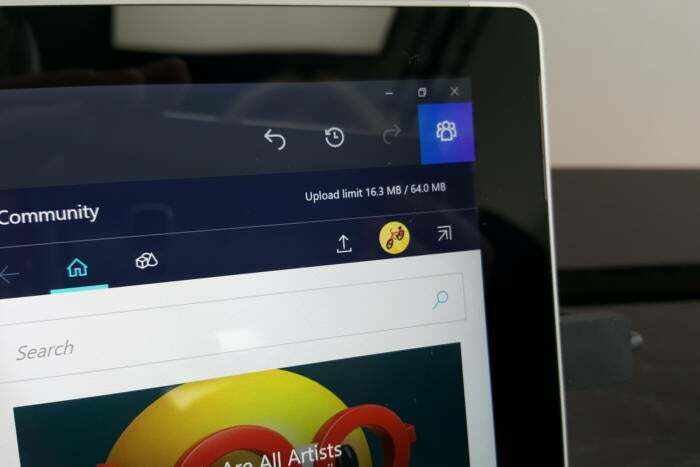 That app got no traction, so for its next attempt, Microsoft folded the features into the familiar Paint name, retooling the app for 3D—which, as of today, Insiders can download from the Windows 10 Store. Sure, you can use Paint for some 2D functions. But this is really about 3D content creation. 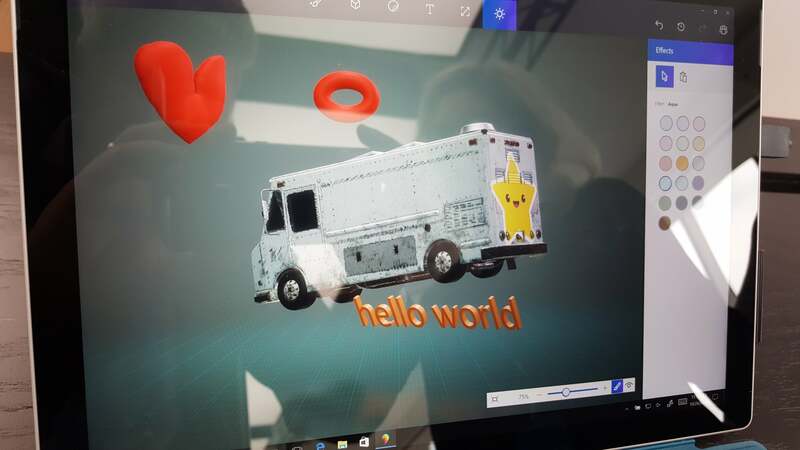 A (rather awful) remixed food truck constructed in Paint 3D Preview for Windows 10. 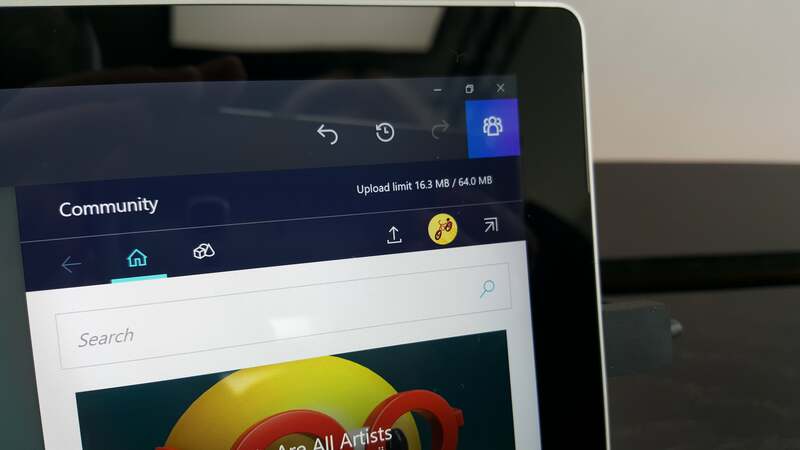 Paint 3D is a UWP app, and unfortunately Microsoft chose to use a series of somewhat unintuitive icons to identify what Paint 3D can do: Paint, then some 3D-ish cube, then some sort of jellyfish thing, text, and a sun? You’ll figure out the sequence: 2D object creation, 3D creation, illustration, and so on, but it’s a bit daunting at the beginning. 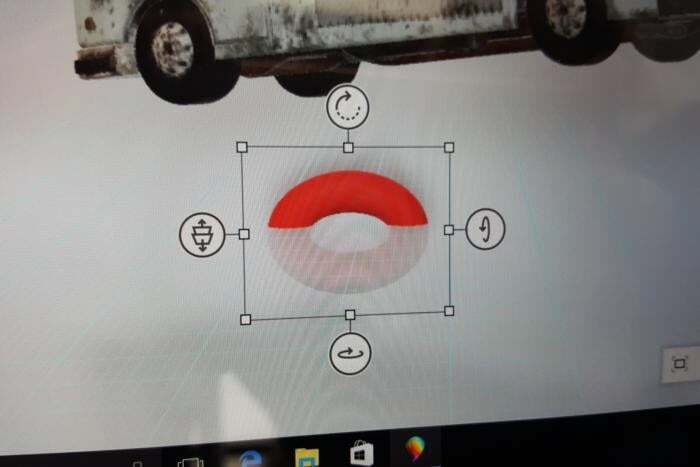 Paint 3D Preview allows you to rotate 3D shapes around various axes, though the small icons may cause you to squint. Note that this object is “buried” in the floor. The 3D cube icon is where things start getting interesting. Here, you’ll have two modes: creating, and viewing—that’s the eyeball and paintbrush down at the lower right. If you start with a blank canvas, you’ll want to create something new. 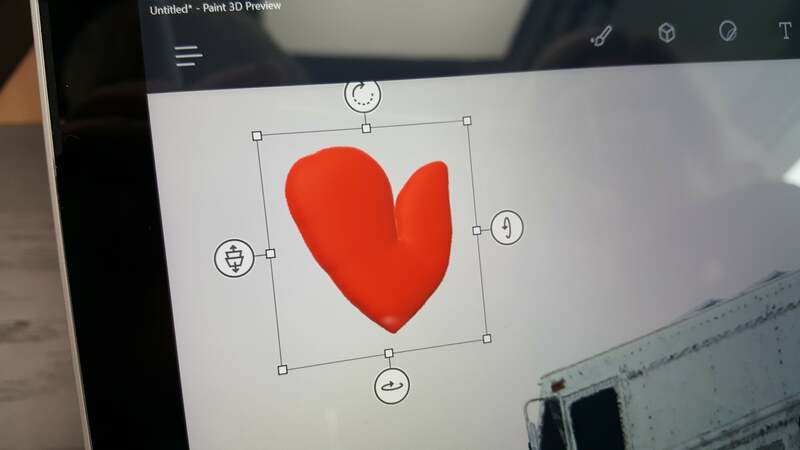 If you’re familiar with the old Paint, you’ll know that the app provides several templates for familiar shapes—circles, rectangles and the like. 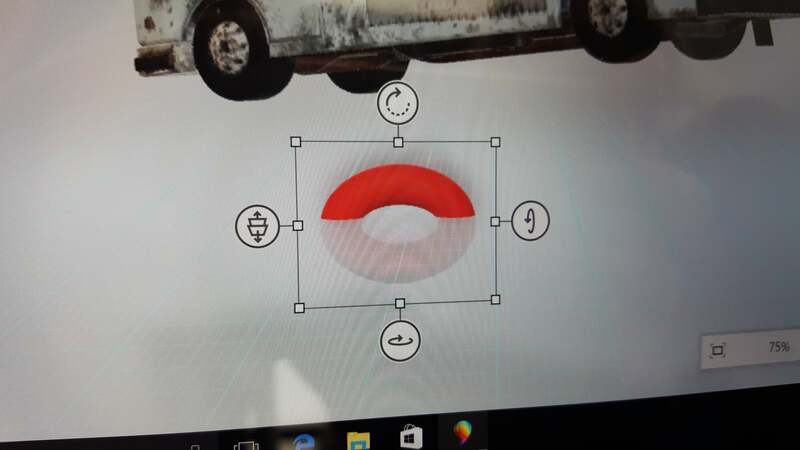 Paint 3D does the same, but with faces, spheres and more. Each 3D object is manipulable: You can resize it, rotate it, and more. If you can’t predefine a 3D object, you can create one of your own. Objects that you and others create can be shared online. Let’s assume, however, that you have my drawing ability—next to none. 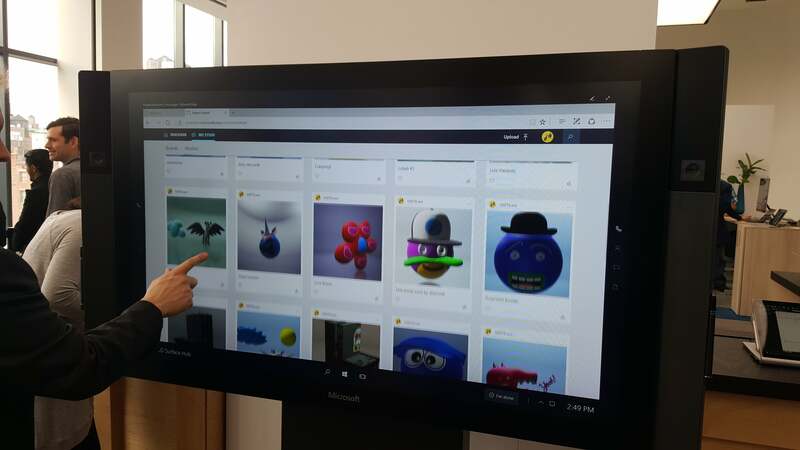 So there’s a second way to create 3D objects: a special Microsoft community site called Remix3D.com, where 3D designs can be uploaded, shared, and “remixed” or edited by others. It’s not clear who owns the objects, but the Remix3D community may be designed similarly to the community of car liveries Microsoft provides for its Forza series of Xbox games, and the “remix” capabilities launched with the Sway app. But wait, there’s more—there’s a third way to create 3D objects. Doodle a 2D shape, and you can “puff” it out to a 3D object. 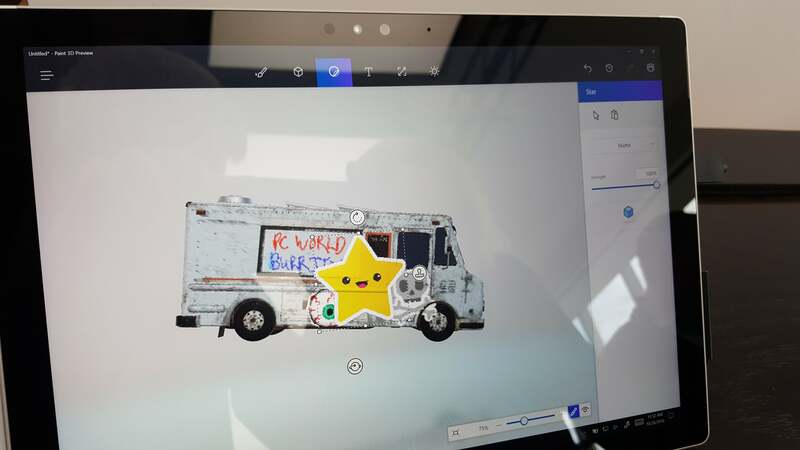 Paint 3D allows you to doodle a 2D object, and then puff it up to 3D. Think of a 2D shape, and then something like a identical throw pillow stuffed with 3D goodness. The resulting object can be uniformly deformed, but I didn’t see an option to lasso a point or region and yank it into a new shape. It’s actually kind of neat, though some 2D objects don’t necessarily translate that well into 3D. 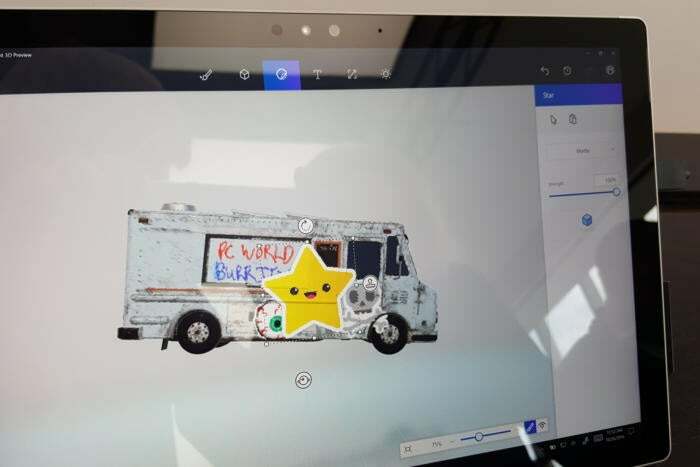 In general, Paint 3D looked quite polished for a preview app. One glitch I noticed deals with 3D text, the fourth option along the icon bar along the top. Text appears in a classic Paint window. But when I tried to type in virtual text, the letters were invisible until I clicked outside the window, which makes it relatively useless for editing. Go ahead and apply stickers to your creation, which will mold themselves to your 3D object when you “stamp” them on. You’ll also notice that objects appear in a virtual room, like a diorama. The borders of the room aren’t sharply defined, allowing effects like “burying” an object partway into the floor—that’s a feature, not a bug. By defining an object in 3D space behind another, you can also set up occlusion and other 3D effects. With the 3D content creation out of the way, the other options are to decorate your objects. You can color them, of course, or apply a short list of custom stickers. The final option controls how your virtual objects are lit: You can control the background color and the direction of the lighting, though I didn’t see a control to change the colors of the virtual lighting itself. Share objects when you’re done. Note that there’s a limit to how large that single object can be in terms of file size. When you’re done, way up in the upper right-hand corner is the Share charm, which allows you to publish your work to Facebook, Remix3D, or other social media. Feel free to add tags, a description, and the like. Eventually, you’ll be able to view your creations as HoloLens holograms, though without a handy HoloLens. 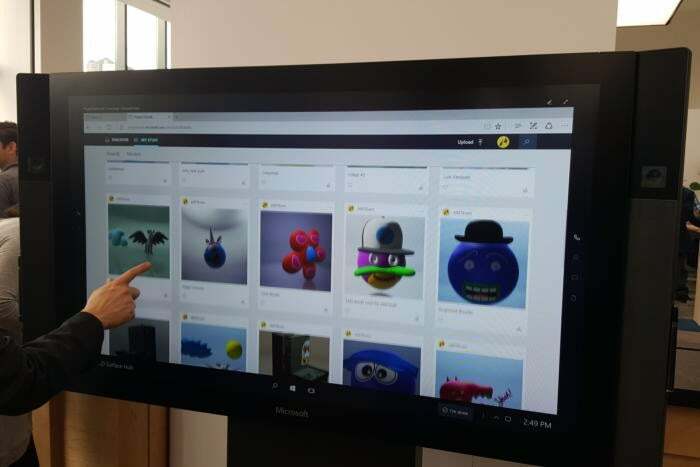 In my mind, Microsoft made a smart move tying community creations to Paint 3D. Doing so preserves the wonder of it all without a great deal of effort. And that’s the whole point.